Vérone társasjáték - Magyarország társasjáték keresője! A társasjáték érték! A Vérone egy nagyszerű társasjáték, 2 - 5 játékos részére, az átlagos játékidő rövid, csak 20 perc. A társast, 8 éves kortól ajánljuk kipróbálni. A játékmenet erősen épít az aukció/licit, a pakli tervezés és a kártya húzás mechanizmusokra. 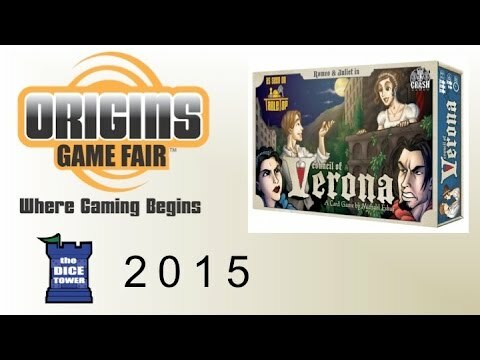 In Vérone, which includes both the Council of Verona base game and the Poison expansion, players take on the role of influential citizens of Verona and act to use their influence to either add characters to the council or cast them into exile. Through thoughtful hand management of their cards and clever placement of influence tokens, players gain victory points based upon the agendas of the characters at the end of the game. The player with the most victory points wins! The Poison expansion adds two new tokens per player to the base game: poison tokens and antidote tokens. Influence Cards that end the game with more poison than antidote tokens on them are removed from the play area, which may affect scoring agendas. We've all heard the story of Romeo and Juliet – now is your chance to steer the story and determine who will rule Verona once and for all!